If you hear the words “plumbing problems,” where is the first place your mind goes? We’d bet that for the majority of people they immediately think of clogged/slow drains. Almost everyone has run into trouble with a clogged drain at some point, and many homes will have drain clog issues more than once a year if they don’t have the drains regularly cleaned. Drain cleaning to fix a clogged drain is one of the biggest services that professional plumbers offer their customers. There are many ways a drain can become clogged up. Below we’ve listed the most common ones, as well as how to avoid having trouble with them in the first place. These three cooking liquids aren’t always liquids. They’re only in liquid form when they’re hot, and it’s easy to mistake them when in this form as something that can be poured down a kitchen drain or disposal without causing any harm. But FOG turns into a waxy and tough solid when it cools down, and this material will adhere to the walls of the drainpipes. It won’t take long for the buildup to start causing clogs and slow drains. Avoid It: Make sure to pour all FOG from cooking into a separate receptacle and take it to the trash. This is the big trouble for bathroom drains, both sink drains and shower/tub drains. Hair may seem like it won’t cause trouble, but it can easily become caught in the p-trap, the curved section of the drainpipe underneath the drain. This traps more hair, soon becoming a snarl that creates a tough blockage. 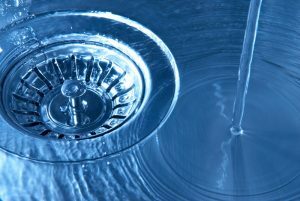 Avoid It: You can purchase drain covers and drain strainers to fit into the drain and stop most hair from going down it. Avoid It: Same way you stop hair—use drain covers. The minerals in hard water will often create a calcite buildup along the inside of drains. This buildup, like FOG, can close off the volume of the drainpipe and make it much easier for clogs to start up. Hard water causes many different problems inside the plumbing, and you want this solved at the root. Avoid It: If your house suffers from hard water, we strongly recommend you have a whole-house water softener installed to counteract the issue. Sometimes, a simple clog won’t need a plumber to fix it. But you may run into a pipe clog that you can’t get rid of by using a drain plunger or a hand-cranked drain snake. In this case, leave the acidic chemical “drain cleaners” on the store shelves and instead call for professional plumbers in Potomac, MD to take care of the job. Nobody stands behind their work like Tuckers Air Conditioning, Heating & Plumbing. Call us for plumbing service in Montgomery County and the vicinity.